This is a great, healthy version of classic creamy pasta sauces. This dish is loaded with vitamins, antioxidants, fiber and more. Did you know mushrooms are a source of Vitamin D? Many Americans don’t get enough Vitamin D, especially during the winter months. Without dairy in our diet it can be even harder to get enough Vitamin D because milk products have it added in. Mushrooms and salmon are a few great food sources to make sure you get it in your diet. 1. Begin by roasting your red pepper. Cut all sides off of the pepper, removing all seeds and white pith. Place cut side down on a baking sheet and broil for 10 minutes or until the peppers blackened. Remove the peppers and place in a ziplock bag or a sealed glass container for 15-20 minutes. This will allow them to steam and the skins will easily come off. Discard the skins and use the peppers for sauce. 2. 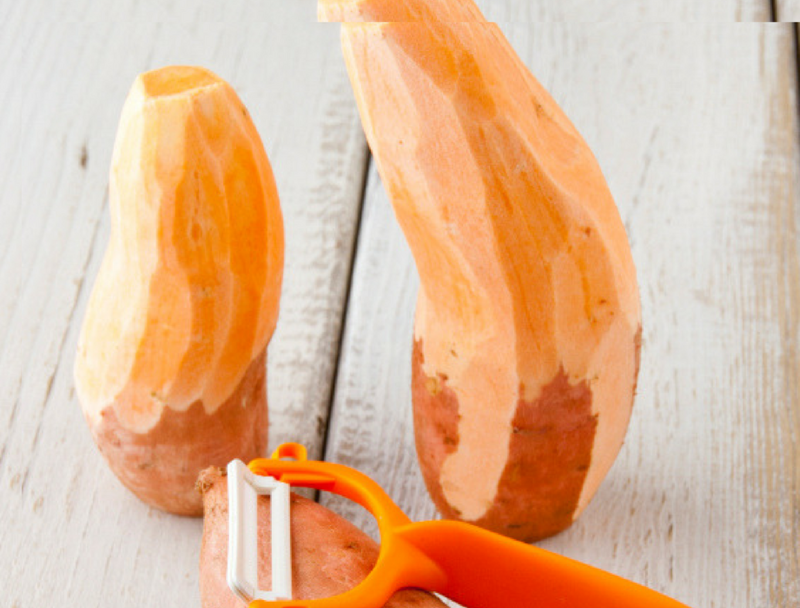 While the pepper is roasting, use a spiralizer or vegetable peeler to peel the sweet potatoes into strips for pasta. 3. Steam 1/2 a sweet potato to use for the sauce. 4. When sweet potato is soft and the roasted pepper is ready, combine all ingredients for the cream sauce into a blender until it is smooth and creamy. 5. Saute the mushrooms and asparagus with a little oil and water. Then add the sweet potato noodles. Saute until just tender and not mushy. 6. Add the “cream” sauce to the noodles and cover with a lid until everything is cooked and heated through. 7. Adjust seasoning to taste and enjoy!